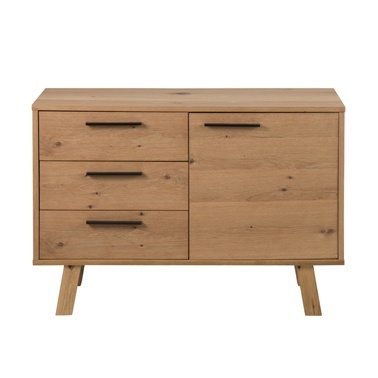 Scandi meets Industrial - Chara Narrow Sideboard from our Danish friends at Actona. Made in Wild-Oak Veneer - a natural knotty oak cabinet, with black metal handles, and solid oak legs. The drawers are on metal runners, so no matter how full your junk drawer is, you can easily find your vital equipment.